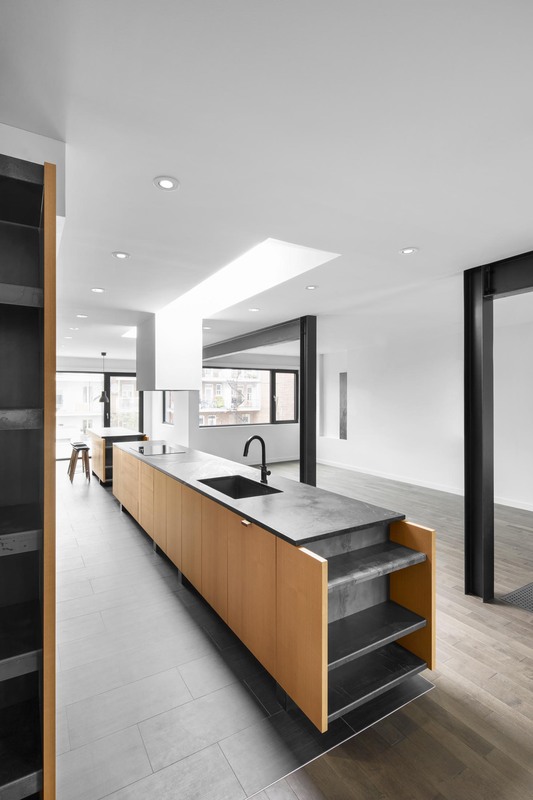 A couple with a passion for cooking acquired a house on Drolet street right by Montreal’s Jean-Talon market. 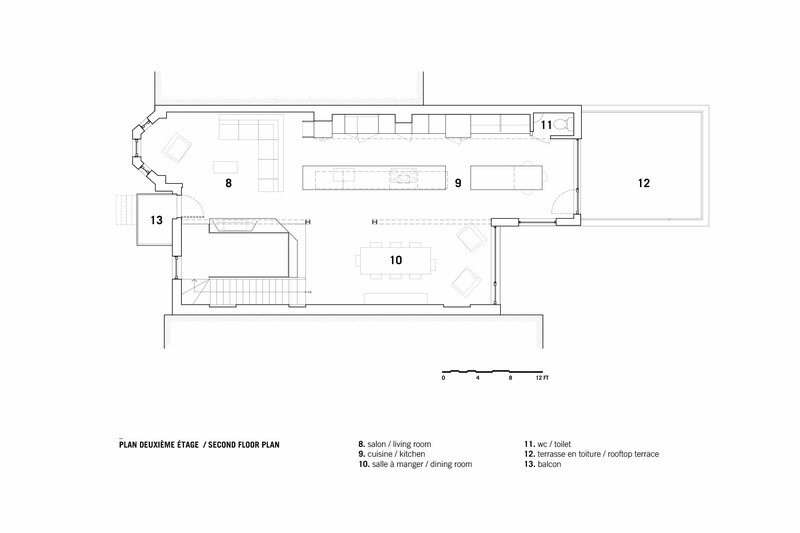 They wanted to do a complete renovation and re-organization of the house and had 2 main demands; firstly they wanted a large kitchen island to be the focal point of the house, and secondly they wanted their living spaces on the second floor where they would benefit from more natural light, while keeping the more intimate bedroom spaces on the ground floor. 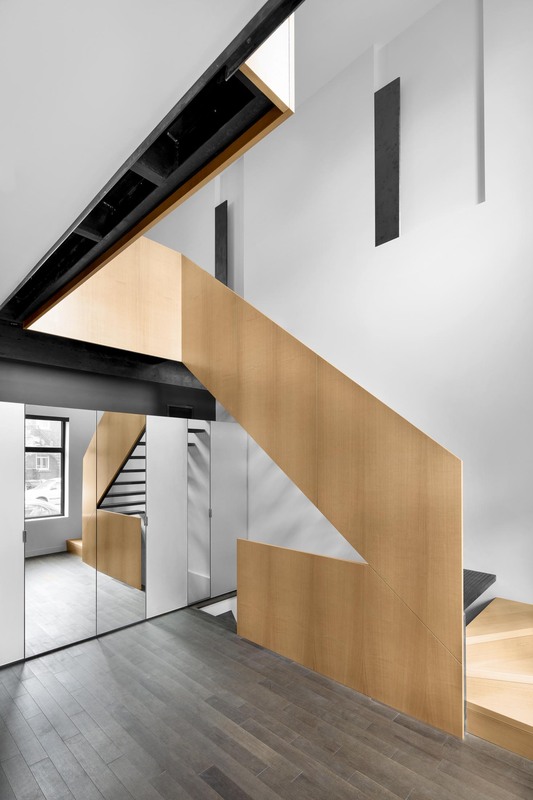 The front door opens onto a double height entry foyer where a sculptural stair draws the focus upwards. 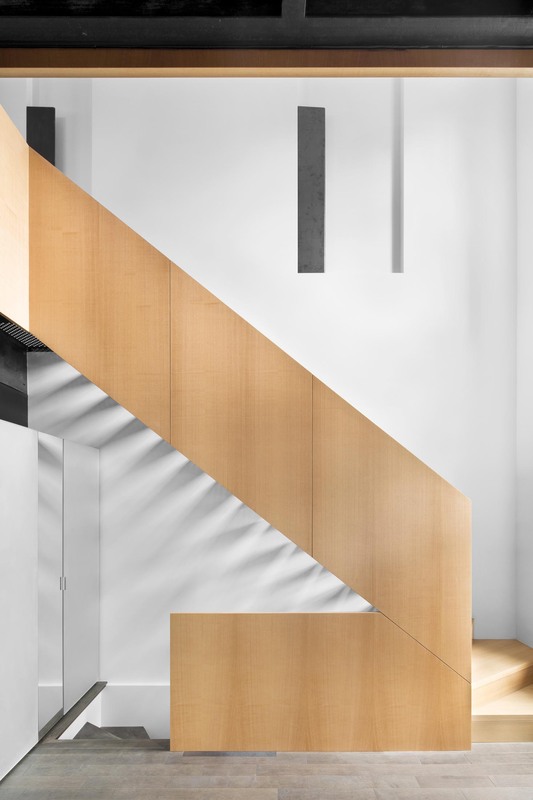 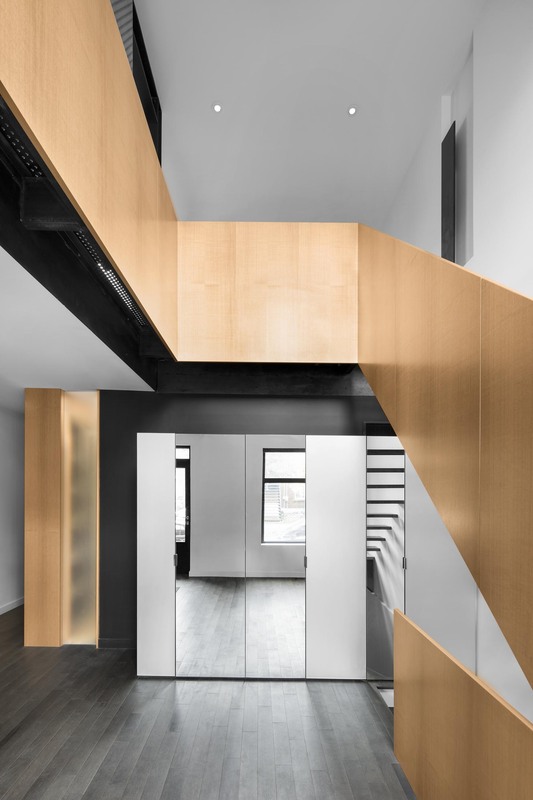 The lines of the stair invite the natural and fluid transition from the ground floor entrance to the living spaces above. 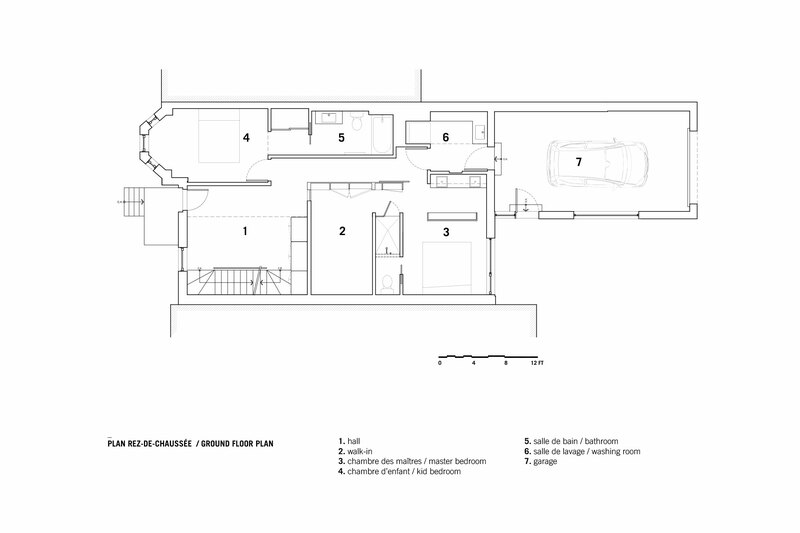 The open plan kitchen, living and dining room are found on the brightly lit second floor. 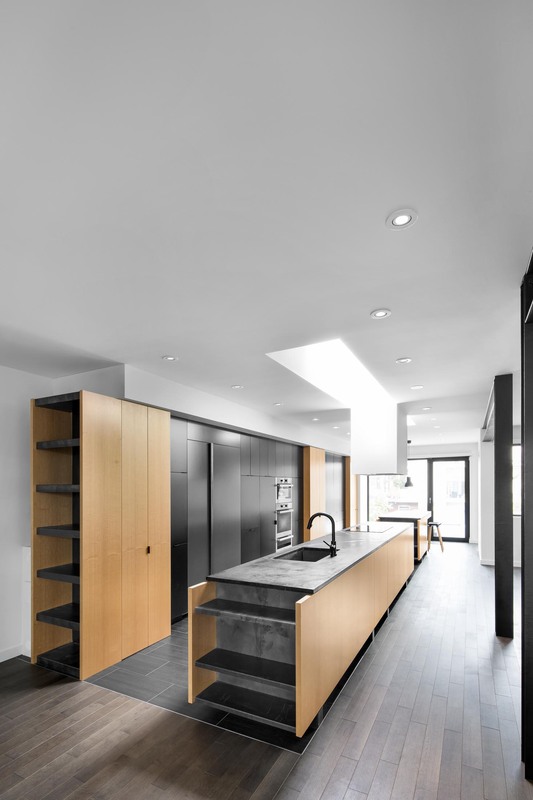 These are all organized around a long linear island topped by a beautiful soap stone countertop. 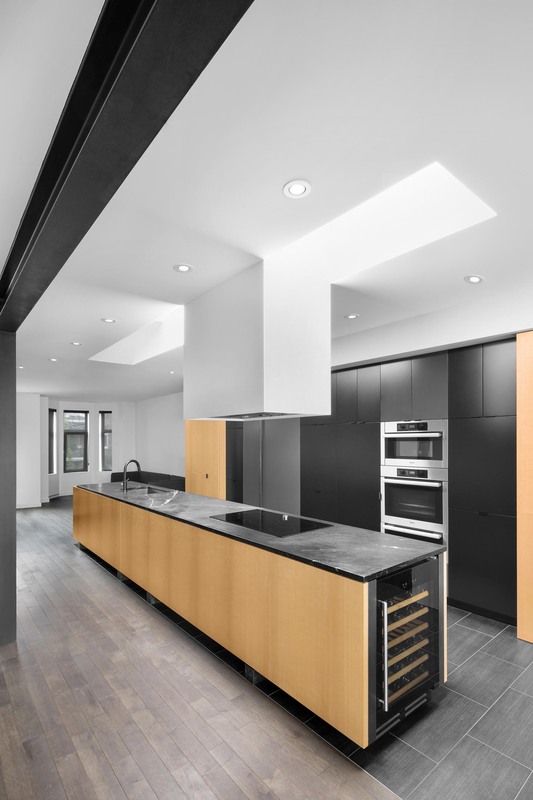 The island basks in natural light as a linear skylight follows its lines directly above. 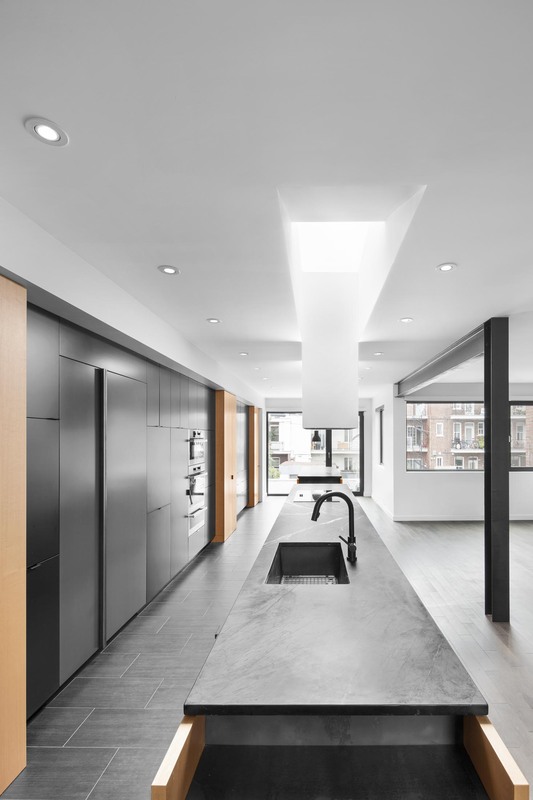 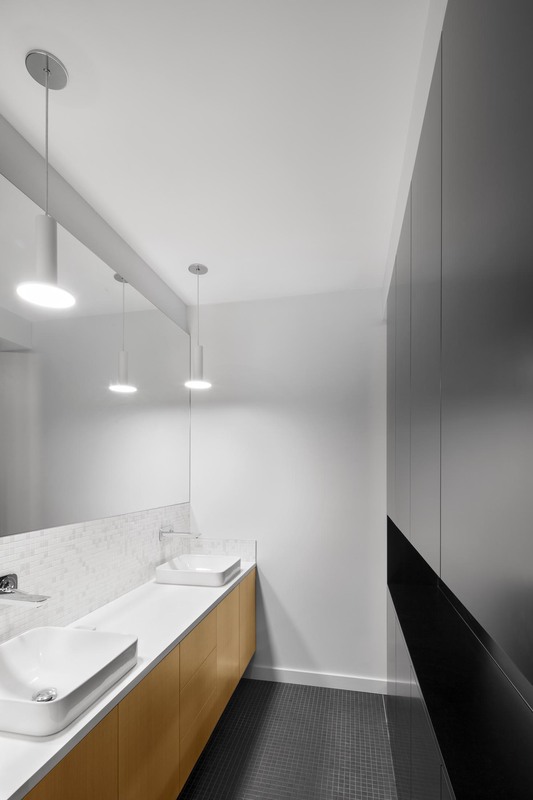 The skylight is interrupted by a monolithic range that protrudes from the ceiling above. 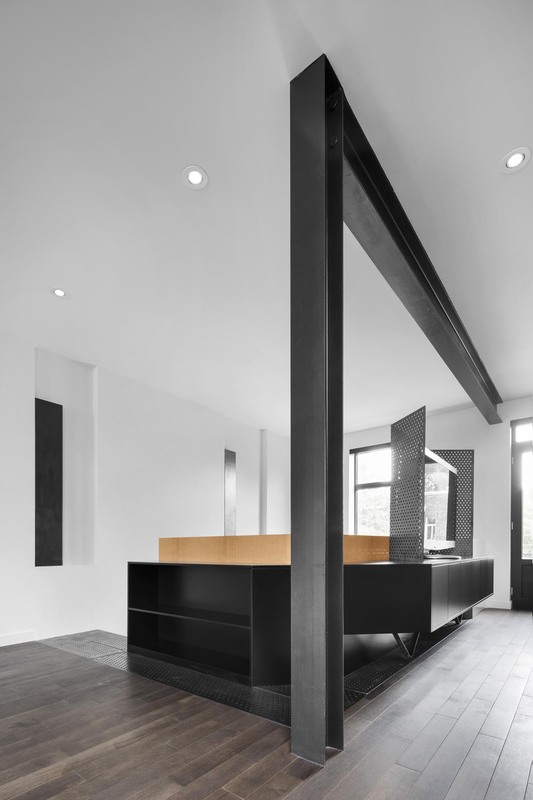 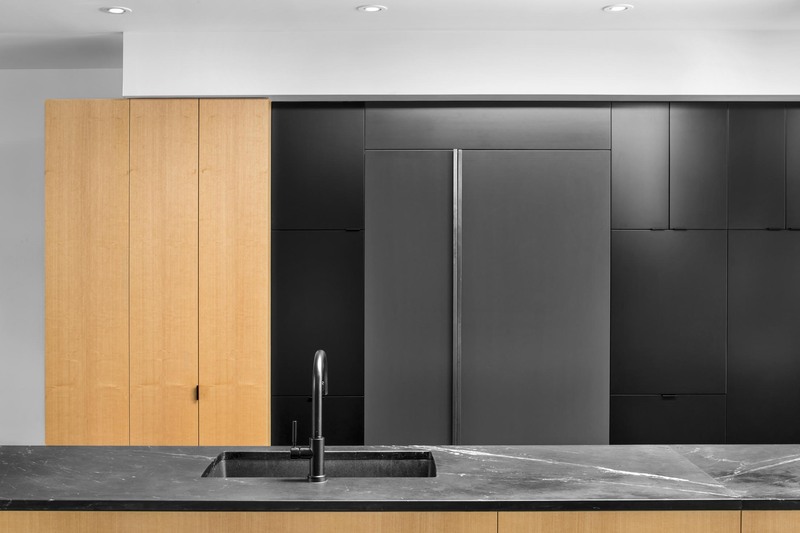 A block of cabinets, clad in a mix of anigre veneer and lacquered doors, is recessed into the wall behind the island. 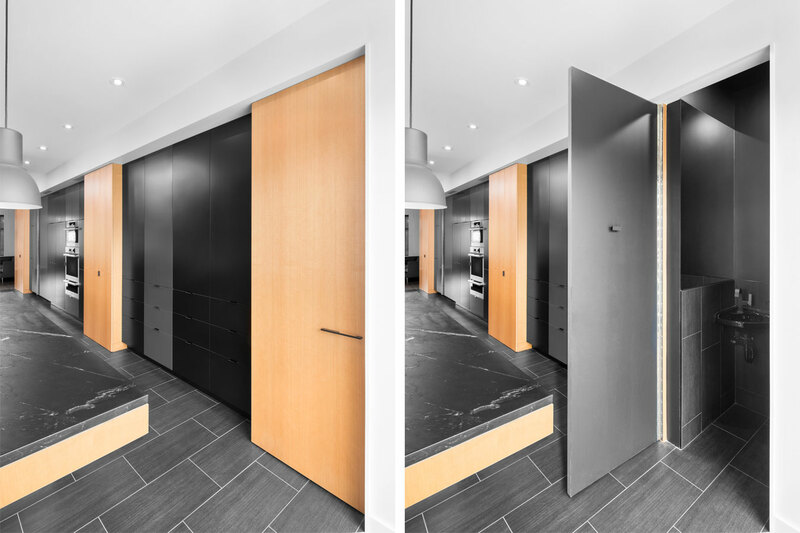 This block conceals the fridge as well as other appliances, pantry storage and a powder room. 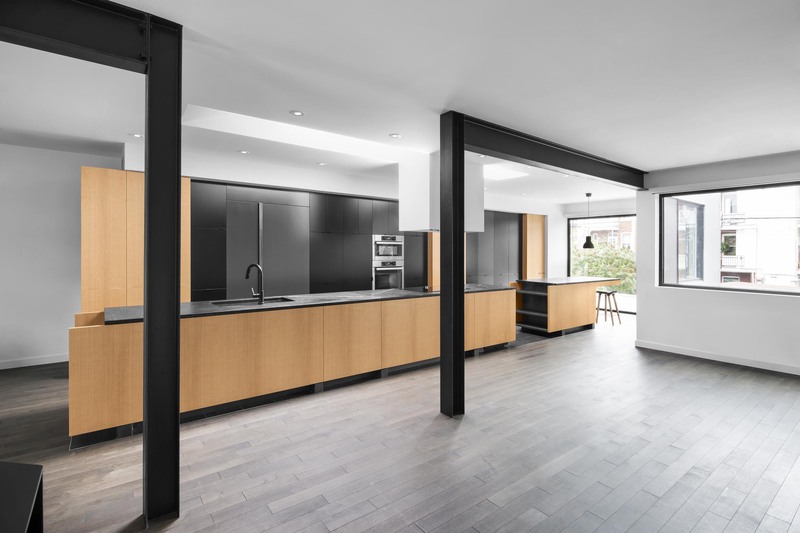 Towards the back of the house, the island breaks-off, into a second island that cantilevers into a brightly lit corner becoming the family’s breakfast table. 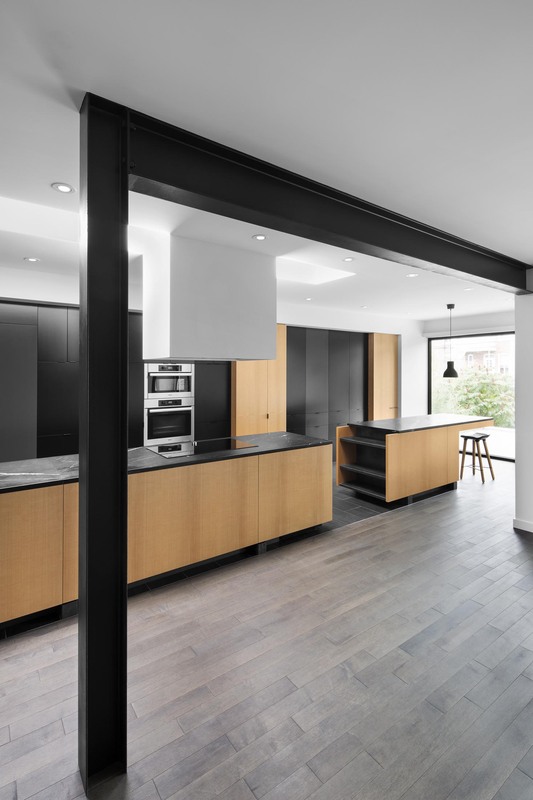 Here, a patio door leads to a large exterior terrace overlooking the backyard.